DC Comics Rebirth initiative has worked its magic once again.Not only has it revived DC storylines from The New 52, it has opened the comics up to some interesting concepts. None more peculiar than the Multiplicity storyline in Superman #14-16. In Superman: Multiplicity, writers Peter J. Tomasi and Patrick Gleason have brought together an odd yet surprisingly super story arc. Superman #14 begins with Clark Kent driving home down a dark, wooded road when he is confronted by none other than Superman. Well, not the Superman you might think. This is the Superman from Red Son, the terrific comic series by Mark Millar. This Superman is the Soviet Union’s Man of Steel from an Elseworlds story. He is badly beaten, and just as Clark tears into his Superman garb, a group of fang-toothed aliens, known as the Gatherers, show up. They are there to take Superman back to the USSR. But Rebirth Superman has other ideas and a terrific battle ensues. The two Supermen finally neutralize the Gatherers, and this is where the fun really begins. A group of Multiverse heroes show up. There is a different version of Rebirth’s Aquaman, Superman, Flash, Green Lantern and Batman. 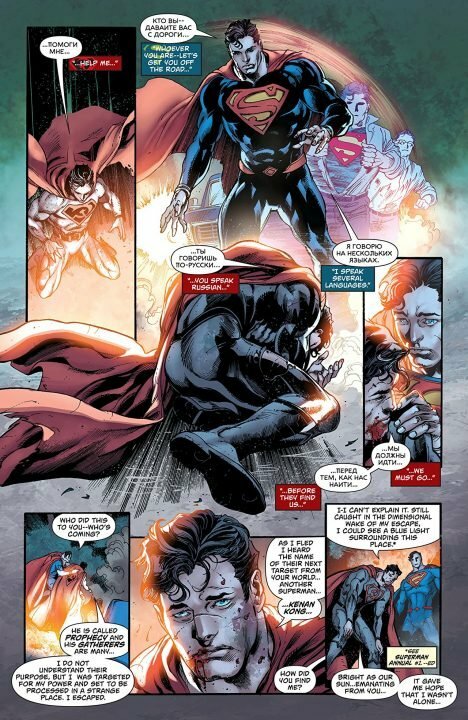 They let Superman know there is a great force threatening the very lives of all Supermen in the Multiverse. A threat that is stealing Supermen and taking their super powers. And this all in the first two-thirds of Superman #14. Tomasi and Gleason have done a terrific job with this quirky idea. Not only have they brought Rebirth Superman into contact with various Multiverse superheroes, they have created an incredibly exciting and compelling story in only three issues. The plot is tight and lean—in such a short mini-series there is no room for anything but the essentials. Something Tomasi and Gleason do expertly. Pitting Rebirth Superman amongst the Multiverse Supermen and superheroes quickly sets our new Superman apart. This Superman evolves to become the leader. And he does this by doing what Superman does best—he puts other’s needs (even if they are superheroes) way above his own. 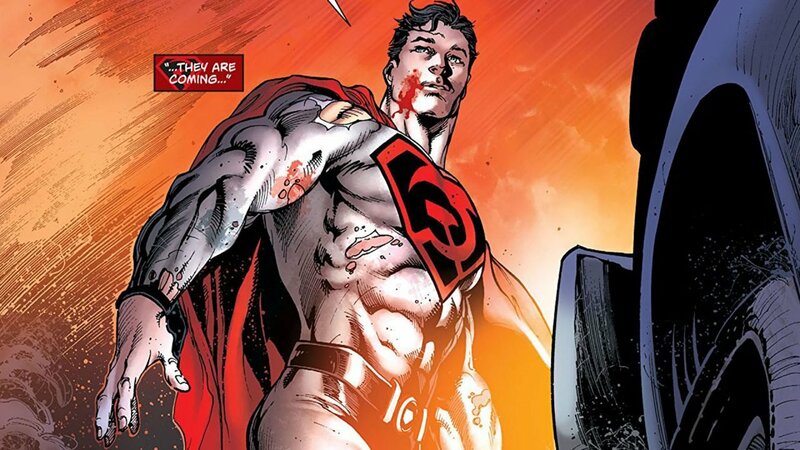 In one short series, readers can see how this Superman is the best of the bunch. He is as great a man as the late departed New 52 Superman and if fans weren’t attached to Rebirth Superman, they will be now. Superman: Multiplicity’s artwork is superbly crafted by Ivan Reis, Ryan Sook, Ed Benes, Clay Mann, Jorge Jimenez, and Tony S. Daniel. It is a truly collaborative mini-series. The action sequences are intense and at times, large-than-life. The intimate moments evoke strong emotion and heart—essentials for a truly super Superman story. Superman: Multiplicity, while short, is a mini-series worth getting your hands on. My skepticism was high when I first came across the concept, but from the opening panels, it became apparent that this story wasn’t only oddly working, but that there would be larger ramifications for DC’s Rebirth universe as well. As the story plays out, that initial sentiment rings true; the stakes were high. We are once again introduced to a collage of Multiverse Supermen, but also things are coming to a head soon for the DC universe. Story ideas that began with Geoff Johns’ first Rebirth comic are ringing truer than ever. Times they are a changing for our DC heroes—for better or worse, only time will tell. Superman: Multiplicity is tight and lean, offering Superman fans a terrific adventure based on an odd premise.